For dealers who want to run private wholesale auction and dealers already running bid sale auctions. Help upset customers get help fast. Help happy customers rate your dealership 5-stars. All for $199mo Nice! Fastest vehicle check-in and lane management. Incredible cashiering, title management and reporting. True Live Multi Cast. HD, no delay, no special downloads. Mobile video of upcoming cars with live walkaround. LANCASTER NY – The newly launched site created by Dealer Simplified’s Kevin Leigh, is devoted to the success of dealer held private bid sales and auctions. There is a growing trend towards dealers wholesaling locally and avoiding auction fees, so the new site aims to focus only on this segment. 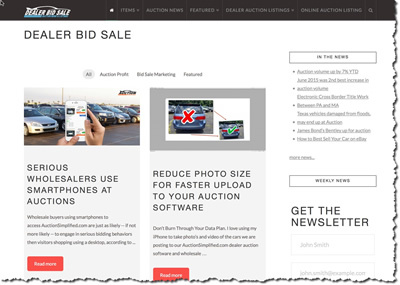 The new Web site features expanded content and articles devoted to helping dealers perform better and master the ins and outs of running a bid sale auction. "Our online visitors will now experience a more vibrant and seamless view of the whole dealer bid sale experience." Says Kevin Leigh, "We already have 51 articles focusing on the subject, including how to market, merchandise and profit. We aggregate the web, filtering news and articles about dealers held auction success." The site will differentiate specifically away from the typical public and off site lane sale news. Currently featured on the home page of dealerBidSale.com are “A 10 step guide to holding your own auction” and “How to welcome wholesalers back into your dealership” Other pages include featured articles designed for the support staff who run the auction. Their industry veteran trainers help dealers run their own bid sales and auctions. By killing off the expenses of transporting cars and the high fees associated with selling cars offsite, AuctionSimplified.com (Dealer Simplified’s core product) has lowered the cost to wholesale cars. Auction Simplified is absolutely free to sellers. No software fees or set up fees. For dealers already running bid sales, they enhance the existing pen and paper style by adding hundreds of online national buyers from their wholesale marketplace. Auto Lane Manager™ Modern Auto Auction Software, built from the ground up to be faster, easier to use and more innovative than anything on the market today. From vehicle check-in to cashiering, Auction Simplified will make your auction life easier. HD Simulcast True HD with pinch and zoom for viewers to get greater detail. Even add a second mobile feed to provide walk-around views of the car as the auction is running. AuctionSimplified.com Upgrade your existing bid sale or start one from scratch, the team at Auction Simplified will make it happen. Full integration with your VMS, VIN Scan, auto tabulation and digital invoicing, it's everything you need to run a modern Bid Sale. Broadcast Appraisal All the features of a Silent Auction bid sale just faster. Your select buyers get notified on their smartphone, bid and buy. UsedCarAd.com Advertising your cars on UsedCarAD.com maybe the fastest and easiest way to sell used cars online! Dealer5Star.com Make it easy for upset customers to get help and even easier for happy customers to give you 5 star reviews. SalesDesking.com Compliant payment menu, showing multiple payment choices with multiple down payments and terms.